Gurugram: Fotographia is the 1st International Student Film and Photography Festival under the hallmarks of GD Geonka University, Sohna, Gurugram in collaboration with Institut Français and Ambassade De France En Inde. The festival will raise curtains on 10 November 2017 with a day long schedule from 1000-1700IST.The prize distribution ceremony will follow the screenings till 1600hrs. The theme for this year is “Celebrating Life”, rooted in its belief that life must be a celebration of human spirit, Fotographia promises budding photographers and filmmakers to speak their mind and portray their perceptions spreading happiness and joy through their lenses. A roster of 30 plus films from across the globe will be screened at the festival. An overwhelming 100 plus film entries have been received from universities across India, UK, Austria, South Africa, Uganda, and Pakistan. The entries from Kampala Film School and Westminster University have received huge accolades from the internal jury. The films have touched upon diverse socio-economic and cultural issues. Photography entries have also come from more than 70 schools across the nation. In its first edition the Fotographia is set to become a platform dedicated to discovering emerging and unknown talents at high school and university levels from around the world. 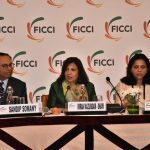 With a view to provide meaningful encouragement and inspiration to the participants, the fest will include a Photography competition for high school level across the nation, followed by work of films and documentaries invited from students from various national and international colleges and universities. Post the screenings in addition to Q&A sessions, the filmmakers will share their valuable experiences. 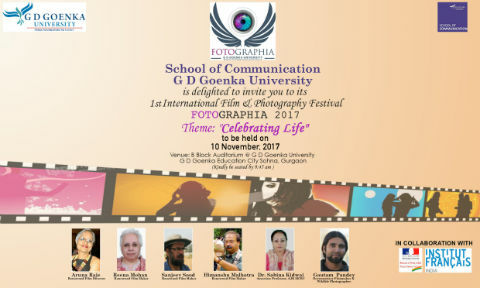 With such a stellar programme, Fotographia 2017 promises to provide a unique and captivating cinematic experience against the backdrop of the beautiful Aravalli Range at the GD Goenka University campus.